if you found any bug or want to suggest,just mail me. I will reply you as soon as possible.So don’t post worthless review here. Support my work by buying the PRO version of this app. File Tools is a collection for Tools to preform some useful actions on files. Now it contains File Renamer,File Finder and Duplicate Finder.In future,i will add more tools based on your suggestions. 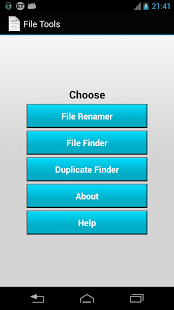 Do you want to rename 1000 files or more than of that.Then really you need this tool.You can rename 1000 files by adding Date,Number,Custom Text etc at your desire position easily by this tool. Don’t know where your files are placed or saved on your Memory Card and want to Search for your desire file easily.Then use this tool.You can easily locate your desire file by choosing a Filters like File Extensions,File Size etc..
Do you have more files in your Memory Card and also having lot of Duplicate files(Same files found in different folders).Then you can easily search for it and able to delete it.By using this tool you can save more memory. Network and Internet:I have included Google Ads in this app.So it need that two permission. The most user friendly in a challenging niche. Great app – doesn’t force you to learn regex code to rename, just tap buttons for options, preview, and away you go! Shocked that so few apps can get batch renaming right – File Tools does. Best in it’s class. File Tools is the best app in it’s class. Had tried other apps before, with complex UI, but File Tools has a friendly UI. Thank you, developer. Just what I needed Works great! Helped me make a boot animation from my phone.